"Jonah! What a sweet name! Except you're going to be obedient to the Lord, aren't you, sweet boy?" 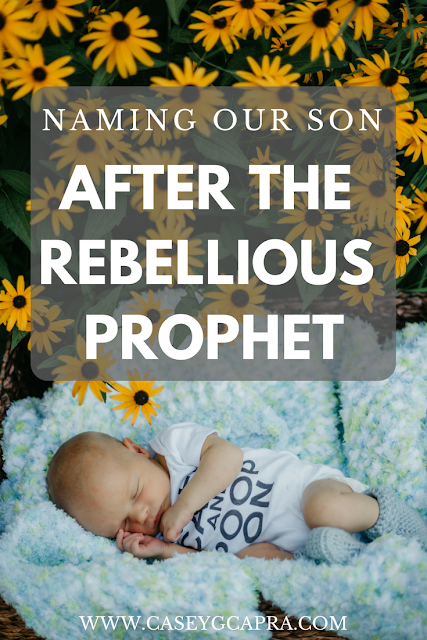 For what seems like the 49th time since Jonah was born - and named - folks hear his name and remind him that the prophet he was named after was rebellious. Disobedient. Not a role model. It's ok. We knew those comments would be inevitable. Jon and I were aware of this before we named him. It was a big part of our consideration because we wanted to be able to share with him the story of Jonah and why we wanted to give him that name. But we were also aware that not many people read the small book of Jonah and say, "Wow, what a guy. I want to be more like him!" If you look up the name Jonah, you're probably going to see it means "cursed." But his middle name - Brooks - means "blessed." Put it together, and little JB's name means "redeemed." Taken from cursedness to blessedness. Saved from a life that is lived under a curse, free to live in redemption and grace. A.K.A. - the Gospel. It is true that the prophet Jonah was rebellious. He was sent to a scary place and ran in the opposite direction. But right at the beginning of his story, I can't help but be struck by the honesty and humanity of his actions. There are so many prophets in the Bible. How come you don't read about more of them running in the opposite direction? You know they did, now and then. They were human! Fast-forward again, they throw him over, storm is gone... and Jonah gets swallowed by a whale. That should be the end of the story. But it's not. Why? Here's where we get to the reoccurring theme of the whole book of Jonah - God never stops pursuing him. Jonah never reaches the end of God's grace and mercy. Jonah never outruns God's love for him! Jonah follows through this time and does what God asked him to do in the first place - he warns the scary city of Ninevah that if they do not repent and turn from their evil ways, they will be destroyed. To his great surprise, they repent! They cry out to God for mercy, and God gives it to them. Jonah has just been God's messenger of mercy. Ok, so then that should also be the end of the story. But it's not. Jonah has picked a spot on the mountainside where he will have a great view of God "throwin' down" on that darn place that got him into so much trouble. And he waits for God to destroy them. He totally misses it. This whole time, you just want to shake Jonah and say, "You blockhead! You're missing the point!" God is giving the people of Ninevah the same mercy that was extended to him in the boat, in the ocean, in the whale and on the shore... and he still doesn't get it. But God doesn't give up on him. In fact, the book ends with God and Jonah having a real heart-to-heart. God gently reveals the bitterness in Jonah's heart - who, at this point, is acting like a real hot-head - and invites him again to come and get to know Him. Jonah was just a man. He was human. He had some heart struggles that honestly sound like mine most days - fear, self-righteousness, pride, stubbornness, ignorance, laziness - but God never gave up on him. When most people hear the name Jonah, they probably think of a man who was stubborn, rebellious, disobedient... but when I hear the name Jonah, I think of a man who was pursued. And that's what I'm going to tell J his name means. I'm going to tell him his name means pursued. That he is pursued by God just like Jonah in the Bible. That Jesus is never going to give up on him. That even when he makes so so many mistakes, he could never run away from God or His love. That God always sees him and loves him. And sometimes if it feels like he was obedient and things didn't turn out right - like that shady tree got eaten by a worm - then he should sit down and have a conversation with God, because He is so so good and take the time to show Jonah the bigger picture. Son, I pray this for you daily. I hope you never know a day that you are unaware of His undying love for you.